Enjoy freedom from habitually and/or subconsciously grinding your teeth with this self-hypnosis mp3 by Steve G. Jones! GRINDING YOUR TEETH, EITHER WHILE YOU SLEEP OR AS NERVOUS BEHAVIOR DURING WAKING HOURS, CAN BE A NATURAL REACTION TO BUILT-UP STRESSFUL ENERGY. 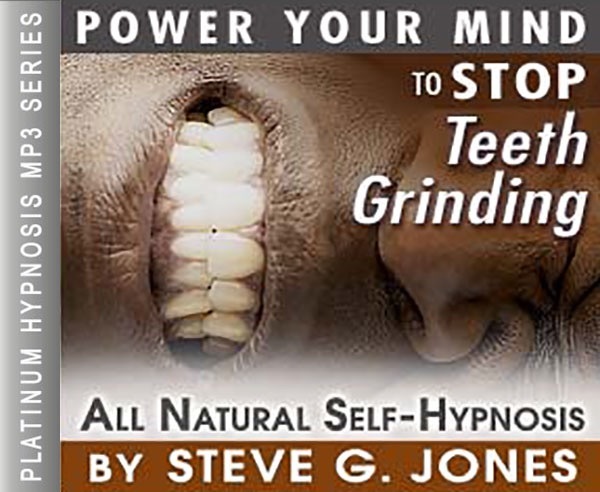 MY STOP TEETH GRINDING HYPNOSIS MP3 CAN HELP! BY PROPERLY DIRECTING THAT ENERGY, YOU CAN RELEASE IT IN A PRODUCTIVE, HELPFUL WAY… BREAKING THE NEGATIVE CYCLE YOU ARE IN. Steve G. Jones, Ed.D., Clinical Hypnotherapist, charges $1,500 for a custom recording and $25,000 for a one-hour private hypnotherapy session at his office. But you can get all the benefits for this low price. Simply listen to the Stop Teeth Grinding Hypnosis MP3 download every night as you go to bed for three weeks and feel the changes happening in your life. You will feel more empowered, more in touch with your true self, and you will truly know that your goals are within your reach. Steve G. Jones achieves AMAZING and LASTING results!!! Hypnosis is the easiest way to affect change in your life because the positive messages go straight to your subconscious mind effortlessly so you can accomplish your goals and reach for the stars!! 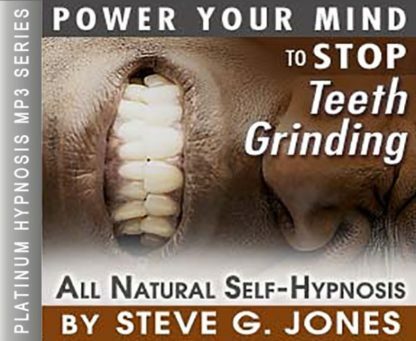 All you have to do is listen to the Stop Teeth Grinding Hypnosis MP3 audio at night as you go to sleep!!! You’ll hear soft music, the gentle sounds of the beach, and the soothing sound of Steve G. Jones’ voice all working together to bring about positive changes in your life easily and naturally. Steve G. Jones has been helping people improve their lives with hypnosis for over 17 years…now it’s time for him to help YOU… don’t wait, do it NOW !!! you’ll be glad you did. See you at the top! And you find that day by day you are becoming more and more relaxed. Just as you are relaxed right now. You will become more and more relaxed in your daily life. Day by day, relaxing more and more. And you will find that you deal with situations as they arise. If there is a problem, you handle it in that moment. You handle it in a very productive, polite, yet assertive way. You are kind to yourself. You are kind to yourself and you no longer have time for negative thoughts or feelings. You fill your mind with productive goals and if you should find yourself grinding your teeth or tightening your cheek muscles, you will want to keep your mouth slightly open, wide enough to place your tongue between your back teeth. This will help your muscles become loose, loose, loose. This will stop your muscles from cramping. The longer your tongue stays between your teeth, the more your muscles will become loose, limp like we cotton and you will find them very soon indeed. You no longer grind your teeth because you are becoming more and more relaxed and teeth grinding is a thing of the past. So just relax now and drift and enjoy this peaceful state you are in. Teeth grinding is a serious problems that can cause jaw pain, headaches, and the wearing down of your teeth. Teeth grinding is also called bruxism. Most people grind their teeth at night and sometimes are not even aware that they are doing it. Doctors agree that teeth grinding is due to stress. Luckily, hypnosis can train your subconscious mind to stop teeth grinding. In addition to helping you relax your jaw instead of biting down, hypnosis will help you reduce the stress in your life, since this is what is most likely causing you to grind your teeth. You can say good bye to your bad habit with this powerful hypnosis program! We suggest you listen to this Stop Teeth Grinding Hypnosis MP3 recording every night for 21 nights in a row as you go to bed. You will receive positive suggestions to help you relax and stop grinding your teeth. Steve G. Jones uses techniques in this hypnosis session to help you release the stress and pressure that is in your jaw and teeth area. As a maintenance plan, we suggest you listen to this self-hypnosis recording on a weekly, bimonthly, or monthly basis to maintain the results.